PCHF should require grantees to report outcome measures in addition to the process measures, such as the number of people served, that they currently provide. Outcome measures can inform PCHF staff whether grantees are contributing to the foundation’s stated vision and goals. This additional requirement should be introduced gradually. The foundation’s evaluation consultant is one resource who could facilitate this process and provide education and technical assistance to grantees. This training initiative directly responds to the above cited recommendation to provide education and technical assistance to grantees regarding outcome measures. 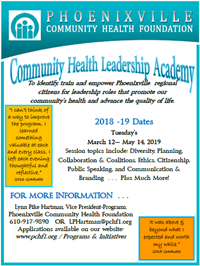 The Phoenixville Community Health Foundation is requiring that every grantee organization complete the Assessment of Program Outcomes Workshop as a requirement for future grant funding. Between January 2017 and April 2018 PCHF has offered twelve Assessment of Program Outcomes Workshops, at no charge, for current and prospective grantee organizations. Going forward, the Foundation will offer the Workshop at least annually to accommodate new grantee organizations and past grantee organizations who did not participate in the initial offering. The workshop will feature a time-tested uniform model for identifying, articulating, and measuring program outcomes. In its one-day format, the training is experiential, featuring hands-on practical exercises, a defined six-step model, and an opportunity for participants to map their own evaluation plans specific to their organizations. Supporting methods and tools such as logic models and qualitative evaluation are also addressed. Tangible take-aways include an Evaluation Workbook, which provides background material, print and video references, and a one-page Outcomes Assessment Worksheet. The workshop will be offered as a one-day workshop. Going Forward Annual Assessment of Program Outcomes workshops dates will be posted on this site and communicated through e-mail and newsletters, with instructions for registration. A document that outlines the Assessment of Program Outcomes Application Process is available.